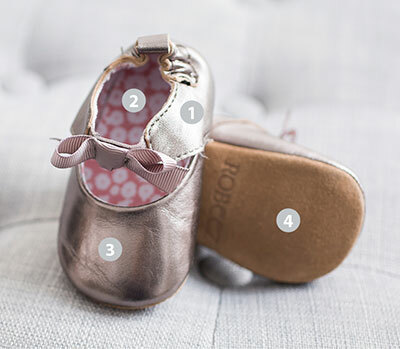 This grey leather baby shoe for boys ages 0 - 2 years old can be worn everyday or for a special event. Faux laces complete this shoes "mini-me" look. Part of our First Kicks collection, this baby shoe has a shoe-like fit and a cushioned insole like our Mini Shoez, but a soft sole suede bottom like our Soft Soles. They’re a little hard to get on so I have learned some cool ninja moves to accomplish this. But once they’re on they are super cute. Glad I bought 2 pairs one for now and one for when he grows. These are cute shoes and made well; my son seems to really like them. But for some reason they are smaller than expected. I bought two pairs of shoes in size five, expecting them to be a bit big, if anything. One pair were mini shoez in size five and they fit perfectly. 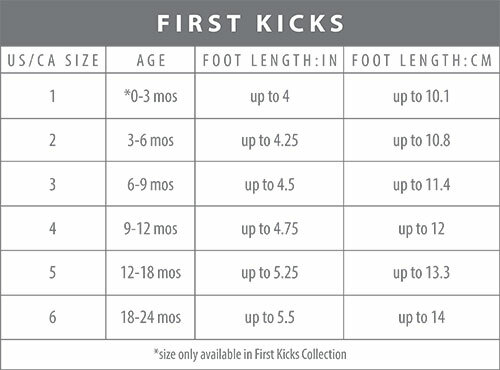 These first kicks are much smaller in the same size though i believe the sizing chart says they will both fit up to 6". I'm disappointed because these will not fit long at all. I'm not sure if this is a fluke in sizing. They are still adorable though! Love these little walking shoes! I researched the best shoes for babies learning to walk and found Robeez. I was hesitant with the price knowing my baby won’t fit them for long but WOW. I am so impressed. They have really helped him take off walking! They are a little hard to get on, especially with socks but they do not fall off and he can’t take them off either. I think he loves them too!